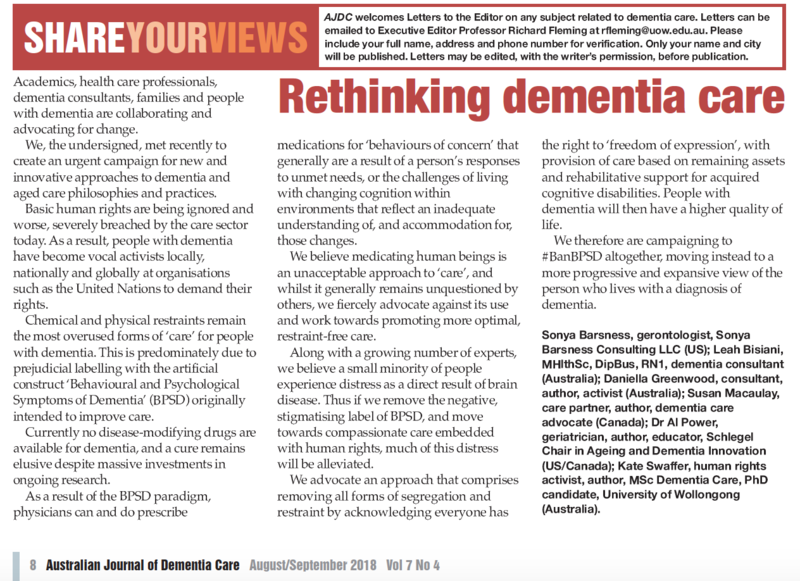 Our first published Letter to the Editor, promoting the continuation of the campaign to ban the false construct known as BPSD (Behavioural and Psychological Symptoms of Dementia). A few years ago, Professor Dawn Brooker started a group called “GAP in Dementia Care”, which consisted of a large group of academics, dementia professionals and included people with dementia who have the lived experience. Many from this last group of members (people with dementia) also have extensive knowledge about dementia, well beyond our experiences of being diagnosed, but have the added ‘benefit’ of knowing what it is really like to live with dementia from the inside out. As a past nurse who has worked in aged and dementia care, and someone who has been a family care partner to people who have died from dementia, I thought I knew a lot… How wrong was I! But I digress… I wanted to explain that three members from the original GAP in Dementia Care group (myself, Daniella Greenwood and Dr Al Power) had brought up the idea that BPSD is doing more harm than good, and is a false construct. There was a LOT of pushback against this back then, and eventually, the discussion died. The GAP in Dementia Care group has been very silent since the late Peter Ashleigh’s death, as he was one of the key drivers behind the IT and website, but a few of us have re-engaged in trying to make positive change for people with dementia, starting with a campaign to ban BPSD. You can see who we are, listed in the Letter to the Editor below recently published in the Australian Journal of Dementia Care. From my observations, dementia can clearly elicit behavioural symptoms. Sadly, for the safety of the person with dementia and the safety of others, these symptoms may need to be temporarily treated with drugs. I think the argument should be about whether these symptoms should be classified as problems. I see no issue at all in talking about behavioural symptoms, just as we would talk about cognitive symptoms, or physical symptoms. Of course you’re welcome to your opinion about this… everyone with and without dementia has behaviours. That’s not really the point I was making. Kate Swaffer, you are absolutely correct. I have received nothing but disbelief when I tell someone my mother died of profound dementia. No, they say, she died of something else–pneumonia–nobody dies from dementia. Well, it’s pretty hard to avoid pneumonia when you can’t eat, drink, walk, or talk. Thank you for confirming what I saw with my own eyes–my mother died of dementia–a very horrible way to die, common in my family, even though we all say, “I’m just not going out that way. I’ll end it myself first.” But when the time comes, all bravado is forgotten along with your own name, your spouse’s name, and the names of the children standing before you whom you raised but do not recognize. Without a mind, the body cannot live. Pneumonia. It’s challenging dealing with life and death… add in the word dementia and almost everything changes! Thank you for writing as you do, Kate! Very very proud that we have come together as a force to be reckoned with Kate, joining with other formidable and global leaders to create such a powerful voice. We, the #BanBPSD Warriors, are finally making the inroads required to challenge the stigmatising and negative behavioural paradigm used to unfairly judge and pigeon hole people living with dementia. This first publication in the AJDC shall pave the foundations for an entire culture change, and become the catalyst to the shift required in publicising to the world that we are now rethinking dementia and are advocating zero tolerate towards the subjective assumptions made about dementia, behaviour and medicating people living with dementia. I’m easy. Whatever gets us the best exposure. I’m very happy for you to publish mine in full, with a link to it online. The revolution has begun. There is no stopping us now babe. I totally agree with all those comments and acknowledge the need for a revamp of aged care practices when caring for those with dementia. We do need to step back and look at each precious person to see who they are and what they need to live their lives fully. We do not need to use medications but dedication to love and care. Two thoughts, with 100 dementias can you be more specic as many have alternative relief sources outside of medical practice in the form of energy medicine and secondly death certtificates should not state dementia as a cause of death, bio marker failures to be more exact are the curprits. Sorry Kate I read this in a WHO comment and did not retain the source. However, from recollection they were putting a study commission together to examine this issue. With your connections can you question the status of this important upgrade of death certificates for any change. Logical since patients do not succumb from AD. No stress Norman… I’ll see if I can find the source! We need a new statistic byline for WHO, pneumonia caused by the partticular dementia for accuracy and universal application. This will allow researchers which bio marker is the frequent killer. We need as I always have stated a revolution of ideas to get others to dream containment and hopefully remission.. I have been proposing an incurable hospital with patients of all types of dementias with the best minds to come together and develop whatever solutions necessary. We must think outside the box or never beat this pandemic.